Superman has just prevented an experimental rocket plane from crashing into a mountain. The pilot has become hysterical and refuses to leave the craft. He shoots the Man of Tomorrow as he is lifted from the burning hulk of the vessel. Unhindered, Superman places the man onto the ground. However, once the person's helmet is removed, the Last Son of Krypton is horrified. What was once a human face is now a twisted mass of lumpy green flesh. Doctors have examined the airman only to find that he has been infected with an unknown space disease. It is assumed that the rocket had passed the Earth's atmosphere for this to happen. Thinking that the microscopic germs have penetrated his skin and costume when he had saved the pilot, Superman flies into a radiation belt in order to decontaminate himself. After his unusual shower, he returns to Metropolis to assume his role of Galaxy Broadcasting anchorman Clark Kent. As he reports the news of the rocket plane's pilot's illness, Clark begins to feel weak and dizzy during the news broadcast. He scans Metropolis to find his sand doppelganger on the roof of the GBS Building. Once again, the mild mannered reporter must assume his true identity of Superman. The Man of Steel confronts his double, but the creature does not respond. His invulnerable body is then stunned by a mysterious force that sends him crashing through the roof into one of the GBS newsrooms. Returning to his feet, Superman receives another shock. All the staff in the office have become like the airman. The alien disease has spread to Metropolis. Superman has alerted the hospital of the space infection at GBS. To top that off, Lois Lane, who had gone to South America to cover a story about a horde of army ants marching into a populated valley, is in trouble. Her plane was forced to land in the jungle. Superman cannot help her without risking her becoming ill. To make matters worse, his sand duplicate is following him everywhere. The Metropolis Marvel cannot seem to fly at top speed. He seems to think that his double, whose sand is now mixed with streaks of red and blue, is the cause of the power loss. This could endanger his plans to aid Lois and rescue Metropolis from the alien malady. Lois and her pilot were uninjured in the airplane crash. Unfortunately, some bandits have captured them, and the army ants are heading in their direction. Superman is deciding on the best course of action as the sand creature approaches him. The Man of Steel then unsuccessfully tries to persuade his twin to leave. As Superman digs a trench to block the bugs' path, two of their number bite his boots. The small beings are now growing in size. One of the giants knocks Superman off balance, but he quickly recovers to defend himself against their attack. The pair of giant army ants is now unconscious, and Superman has noticed the one that he had hit with his right hand has gotten bigger. Knowing that their size would doom them to a premature death anyway, Superman flies into space to rid the Earth of both insects and himself. As the Last Son of Krypton ponders exile in space, his powerful eyes see the horde of army ants is approaching Lois and the others in the jungle. The airplane pilot sees this as a chance to be a hero to impress the ace reporter. However, as he reaches for one of the bandits' guns, the man is knocked unconscious. The hungry mob of insects is getting closer to the group as the thieves run away leaving Lois to drag the airman with her. Despite all odds being against her, Miss Lane refuses to give up. Doctors have found that the alien disease can be cured with liquid freon. They are asking for Superman to return, but their pleas go unheard. The Man of Tomorrow is in space being confronted by his Doppelganger. He believes that his twin can save Lois. However, he must get the creature to understand the situation. Superman reaches out to his double with his right hand. However, the creature does not grow. Instead, it emits an energy that seems to cleanse the Kryptonian hero's body of the alien germs. The Man of Steel surges closer to the mysterious being. Once they have collided, the dormant form of Superman plummets to Earth. Lois has become exhausted from dragging the injured airplane pilot. Suddenly, she feels the ground shake. A huge crater has formed, and emerging from it is none other than Superman. Despite being unable to fly after contact with the sand being, the Metropolis Marvel carries the airman and tells Lois to hold on tightly to his cape. A powerful leap over the mountains sends the trio into the path of the bandits that had captured Lois. They shoot at our hero, but he feels the bullets bounce off his chest. The Last Son of Krypton is not at full power. However, he is able to knock out the group of thieves and crush their weapons. Lois Lane has once again been rescued by Superman. With Lois and the pilot safe, Superman can now question his double. The sandman's body seems to be solid as it resembles its Kryptonian counterpart more. The eerie being also has just gained the ability to speak. Every time, it was near Superman, the twin would get some of the abilities that the Man of Steel had lost. Kal-El will recover from his current weakness, but not entirely. When he does, the Doppelganger will be his equal. The double is becoming Superman, and neither of the two beings may survive the experience. Story - 4: We have a complete issue devoted to "The Sandman Saga" without a back-up story to interrupt the flow of the action. This is an amazingly well-crafted issue. However, I knocked off one point because of one thing. 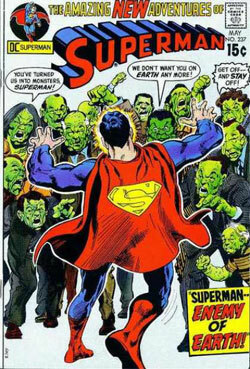 Superman was willing to infect ants with the alien germ. This is something that is extremely out of character for the Man of Steel because all life is sacred to him. Superman would rather die than sacrifice his own beliefs. This is what makes him Superman. Besides this flaw, this book has an incredible story full of action and suspense. This one made me impatient to read Superman #238. Art - 5: Curt Swan and Murphy Anderson have done it again. No art team can do what they have accomplished for the Man of Steel. They are able to blend various genres into the book and make the story look incredible. Many times, I forgot that I was reading a comic book because the images look like they could be part of a movie or television show. That's how good the Swanderson team is. We need more art like this in comic books nowadays. Cover Art - 5: This image reminds me of those old horror films where the villagers with torches and pitchforks chase the monster. This seems to be the intention, and it works. It makes the viewer want to look inside and read the book's contents. Whatever happened to covers like these? There needs to be more like them in comic books in this day and age.